Welcome to Barley’s! 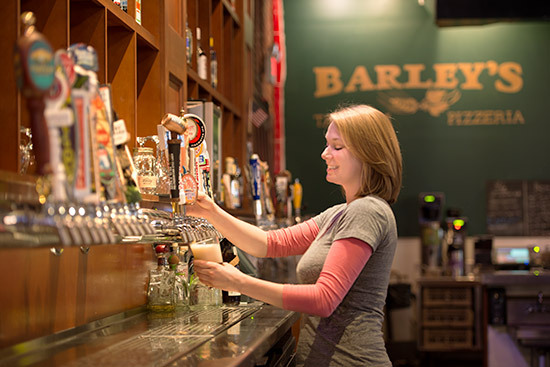 Located in Knoxville’s Historic Old City at 200 E. Jackson Ave. , Barley’s offers great food, live music and the best draft beer selection in Knoxville. Our menu features pub favorites such as hand-battered chicken tenders, juicy burgers, southwestern wraps and fresh salads in addition to changing daily specials and an incredible selection of customizable, unique pizzas. With 96 beers on tap and even more in the bottle, you’d be hard pressed to find a better selection of hoppy, malted goodness anywhere in town. With daily drink specials including half price pints on Tuesday, there’s certain to be a perfect day (or two or seven) this week to join us for a meal, a drink or both!